JOHN J. WILD is a distinguished professor of accounting at the University of Wisconsin at Madison. He previously held appointments at Michigan State University and the University of Manchester in England. He received his BBA, MS, and PhD from the University of Wisconsin. John teaches accounting courses at both the undergraduate and graduate levels. He has received numerous teaching honors, including the Mabel W. Chipman Excellence-in-Teaching Award and the departmental Excellence-in-Teaching Award, and he is a two-time recipient of the Teaching Excellence Award from business graduates at the University of Wisconsin. He also received the Beta Alpha Psi and Roland F. Salmonson Excellence-in-Teaching Award from Michigan State University. John has received several research honors, is a past KPMG Peat Marwick National Fellow, and is a recipient of fellowships from the American Accounting Association and the Ernst and Young Foundation. John is an active member of the American Accounting Association and its sections. He has served on several committees of these organizations, including the Outstanding Accounting Educator Award, Wildman Award, National Program Advisory, Publications, and Research Committees. 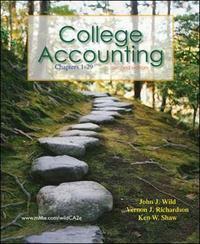 John is author of Financial Accounting, Managerial Accounting, and College Accounting, all published by McGraw-Hill Education. John's research articles on accounting and analysis appear in The Accounting Review; Journal of Accounting Research; Journal of Accounting and Economics; Contemporary Accounting Research; Journal of Accounting, Auditing and Finance; Journal of Accounting and Public Policy; and other journals. He is past associate editor of Contemporary Accounting Research and has served on several editorial boards including The Accounting Review. KEN W. SHAW is an associate professor of accounting and the KPMG/Joseph A. Silvoso Distinguished Professor of Accounting at the University of Missouri. He previously was on the faculty at the University of Maryland at College Park. He has also taught in international programs at the University of Bergamo (Italy) and the University of Alicante (Spain). He received an accounting degree from Bradley University and an MBA and PhD from the University of Wisconsin. He is a Certified Public Accountant with work experience in public accounting. Ken teaches accounting at the undergraduate and graduate levels. He has received numerous School of Accountancy, College of Business, and university-level teaching awards. He was voted the "Most Influential Professor" by four School of Accountancy graduating classes and is a two-time recipient of the O'Brien Excellence in Teaching Award. He is the advisor to his school's chapter of the Association of Certified Fraud Examiners. Ken is an active member of the American Accounting Association and its sections. He has served on many committees of these organizations and presented his research papers at national and regional meetings. Ken's research appears in the Journal of Accounting Research; The Accounting Review; Contemporary Accounting Research; Journal of Financial and Quantitative Analysis; Journal of the American Taxation Association; Strategic Management Journal; Journal of Accounting, Auditing, and Finance; Journal of Financial Research; and other journals. He has served on the editorial boards of Issues in Accounting Education; Journal of Business Research; and Research in Accounting Regulation. Ken is co-author of Financial and Managerial Accounting, Managerial Accounting, and College Accounting, all published by McGraw-Hill Education.